This post is to answer a question for a reader of my blogs who want the text centered and to have a caption below the photos. The easy way to center text is to work in the Compose Mode by clicking on the COMPOSE tab in the top right-hand corner of the post editor. Prepare your post in the Post Editor window in the normal way, and then when you are finished, highlight all the text, then click the Align Center tab in the Post Editor toolbar, and the text will all be center aligned. To put a caption for the photo, you have no choice, but to do it in the EDIT HTML mode. Upload a picture. By default, the picture will be uploaded to the top of the post editor irrespective of where your cursor is. 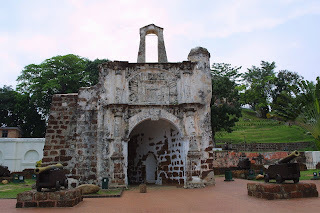 I am going to upload a picture the remnants of an old Portugese fort in Malacca, Malaysia (copyrighted by Tourism, but can be used for the purpose of promote tourism to Malaysia. I am also posting this photo in the hope that you will visit Malaysia as Malaysia is having a Visit Malaysia Year now with lots of programs prepared for visitors. See Guide to Malaysia). As I have mentioned in earlier posts, it will be useful to know a bit about HTML and CSS as it is very hard to avoid it even if you are using the New Blogger, just as you cannot avoid it now. When I use the "Align center" icon above, what I have done is to surround the text with the <div style="text-align: center;"> and </div> tags, that is put <div style="text-align: center;"> at the beginning of the text, and </div> at the end of the text. All text that is placed between these 2 tags will be center-aligned. It will be above the <div style="text-align: center;"> tag. (This blog is still using the old (classic) template, but with the New Blogger template, the HTML will be slightly different, but similar). To place it elsewhere, highlight the whole HTML, cut and paste in the spot you want it to be. Regarding the caption, all you have to do is to look for the last </a> tag, and type in the caption, eg. ..id="BLOGGER_PHOTO_ID_5022244686822436482" />A'Formosa, Malacca, Malaysia</a>. This caption is centered because it is already included in the text-align center tags. If your texts are not center aligned, then you will have to type the caption as <div style="text-align: center;">A'Formosa, Malacca, Malaysia</div>. Search engines cannot read pictures. For search engine purposes, and also so that text will be displayed when for some reasons the picture can't be displayed, add some description between the quotation marks in the alt"" attribute, eg alt="A'Formosa, Malacca, Malaysia". And for the caption to be centered, make sure it is pasted before the last </div> tag, otherwise you will have to center it yourself. However, there is a pleasant suprise. In the old Blogger account, each time you change settings, you have to republish. With the new Blogger account, even though I have not migrated to the new Blogger template, I don't need to republish. Further, I can now add labels to my posts, though I still do not know how I can use this feature without Layout (which is only available with the new Blogger template). Probably, the labels will only be shown at the bottom of the post, but I will probably not be able to add a list of labels in the sidebar. We will see what happens when I publish this post. Well, after publishing, I see the label "test" and "migration" at the bottom of the post. If only there is a way to get the list of labels into the sidebar without having to migrate to the new Blogger template. Darren over at Problogger.net is having a group writing project where bloggers submit what they would do differently if they were to start their blog all over again. The original header for this blog is actually Blogger for Dummies. This project sounds like a good excuse to explain to readers why I need to change the header. I would also have used the URL http://blogger-for-dummies@blogspot.com rather than http://bloggerfordummies.blogspot.com. This is because search engines cannotdistinguish between combined words. You may unintentionally end up with domain names that convey other impressions than the one you intended. Look at the funny results, for example, in this article: The top 10 unintentionally worst company URLs (close new window to get back to this page). I have read the posts on Darren's group writing project and have noticed a few bloggers mentioning they would not have started with Blogger and would have preferred Wordpress instead. However, I have a different experience with Blogger. There have been complaints about Blogger support being slow to respond. However, just recently, I contacted Blogger support to ask them to remove the post word verification, and it was done within 24 hours. I think I will stick with Blogger. Update 20 November 2007: I have been meaning to write an online book for Blogger bloggers and have registered a subdomain http://dummies-guide-to-google-blogger.blogspot.com for the purpose. Didn't do anything about it as I was waiting for Blogger beta to stabilise. Now that Blogger Beta is almost complete, and I got a query from a reader of my blogs, I though I might as well start it off by answering her with a post in that blog. I have since answered 2 other question in that blog. 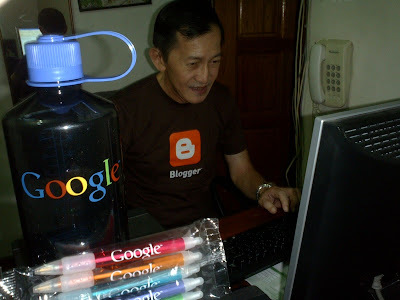 Do have a look at my new blog Dummies Guide to Google Blogger. Now this blog and the new blog share the same title. I will have to change the title of this blog again. Anyone has any suggestion? I think I will change the Header to "Dummies Guide to Blogger Classic"
Note: This blog is in no way connected to Wiley Publishing, Inc., the "for Dummies" trademark owner. (This disclaimer is added because of a tip from ianfusa whose site is AdWords for Profit (close new window to get back to this page).